Tuesday, December 11, 2018 at 7:30 p.m.
MANNHEIM STEAMROLLER CHRISTMAS by Chip Davis has been America’s favorite holiday tradition for over 30 years! 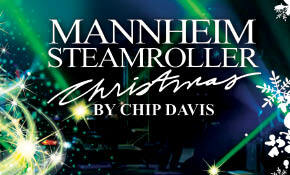 Grammy Award® winner, Chip Davis, has created a show that features Mannheim Steamroller Christmas classics along with a selection of compositions from his groundbreaking Fresh Aire series which introduced the distinctive Mannheim sound to all of America. The program celebrates the group’s recent anniversary of 30 years since the first Christmas album and 40 years since the first Fresh Aire album and includes dazzling multimedia effects performed in an intimate setting. Experience the magic as the spirit of the season comes alive with the signature sound of Mannheim Steamroller. Their holiday CDs have become synonymous with Christmas and continue to occupy top spots on Billboard’s Seasonal Charts every year! Pre-Sale: Tuesday, July 24, 2018 at 10:00 a.m.
On Sale: Friday, July 27, 2018 at 10:00 a.m.
Pre-sale tickets will be available online only at https://bit.ly/2KA0vMV with the pre-sale password. To receive the pre-sale password, please sign up for our free email distribution list at https://bit.ly/2nYHtZ8 by Monday, July 23, 2018 at 11:59 p.m. Tickets on sale to the general public will be available at https://bit.ly/2KA0vMV, Ticketmaster by phone 1-800-745-3000 or in person only at The Dow Event Center Box Office.